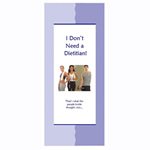 Women's Health Private Practice Marketing Brochures: Do I Need a Dietitian. Build your referral base by dropping off or mailing a copy of the brochure to OB/GYN practitioners, women's spas, and eating disorder treatment programs in the area. Offer to give them a supply to give out to patients that would benefit from nutrition counseling. Patients will call when their women's health professional hands them this great promotional piece. Help build your referral base! Proven results in gaining referrals from women clinics. Attach your business card or a contact info label to each brochure, and mail one to each OB/GYN practitioner, woman's spa, and eating disorder treatment program in the area, with a note that says you’d be glad to send more. Or drop off a stack of brochures (business cards attached!) in a plastic brochure holder to women's clinic professionals with whom you already work. This brochure will build your practice and your referral base by showing women's health professionals what you can do, and reassuring patients that you’re on their side. 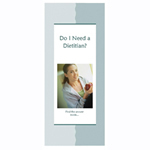 Do I Need a Dietitian brochures reach your patient at the point of contact, when their women's health professional refers them to you. Brochures come in packs of 50, with two locations to place a business card or label with your contact information. Scenarios include a wide array of women’s health issues… pregnancy, multiples, PCOS, infertility, amenorrhea, disordered eating, gestational diabetes, post-partum weight loss and so on. If you work in women’s health or with OB/GYN practitioners, this brochure is for YOU. Coming soon—Dietitian Marketing Brochures for Diabetes, Weight Management and Cardiology. Email info@understandingnutrition.com your specialty area(s) and mailing address to receive a sample of any brochure. For each 100 brochures ordered, you'll receive a complimentary acrylic brochure holder. Customization is available for orders of 1000 brochures, which also include 10 brochure holders. To customize brochures, we include your name, your company or facility name, logo, and even your photo directly on the brochures. (Please note: sample brochures include Texas dietitian credentials. Standard brochures will include generic RD information or credentials for your state if customized.) Standard brochures are $1 each in batches of 50. Customized brochures are $700 per 1000. 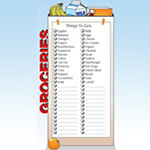 This magnetic shopping list is to give out to patients and referral sources. Patients can start their food selection right in your office or the list can be a visual reminder cue of their goals the days between appointments. 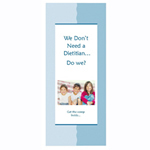 Pediatric Private Practice Marketing Brochures: We Don't Need a Dietitian...Do We? Build your referral base by dropping off or mailing a copy of the brochure to pediatricians, children centers, urgent care centers and school nurses in the area. Offer to give them a supply to give out to parents of children that would benefit from nutrition counseling. Parents will call when their children's service center gives them this great promotional piece. Sports Nutrition Private Practice Marketing Brochures: I Don�t Need a Dietitian. Build your referral base by dropping off or mailing a copy of the brochure to gyms, sports clubs, and fitness studios in the area. Offer to give them a supply to give out that describe benefits from nutrition counseling. Athletes and exercisers will call when they pick up this great promotional piece. 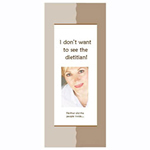 Physician targeted marketing brochure -- I Don't Want to See the Dietitian. Build your referral base by dropping off or mailing a copy of the brochure to physicians and health professionals in the area. Offer to give them a supply to give out to patients that would benefit from nutrition counseling. Patients will call when their physician hands them this great promotional piece.